Its head office in Coventry was the opening venue for a series of road shows that King Long is taking across the country to promote their new range of vehicles. Despite a rather cold and damp day, operators turned up to test drive King Long’s latest offerings and Kirsty Flatt took the opportunity to jump on board. It is nine years since King Long were first introduced to the UK market and it hasn’t been without its problems, but the team are quick to reassure us that the problems of the past are exactly that, a thing of the past and have introduced a number of opportunities to get operators behind the wheel of their coaches and promote the improved services they have on offer. King Long has had a dedicated European arm for some time, with operations also in France, Italy and Germany. The UK was the first country in Europe to stock their coaches and it is predicted that they will knock France off the number two spot in terms of sales by the end of this year. Ray McNally, Sales Director at King Long suggested that the coaches were ‘the fastest growing brand in Europe’, and with an estimated 150 coach sales predicted for the UK this year from the dedicated European production line and the next 92 being built already sold, it suggests demand is currently exceeding supply. Ray was quick to assure me that by the end of the year, they will have ‘caught up’ and that stock vehicles will be available to view and test drive at each of the King Long after sales depots at head office, London and Scotland. 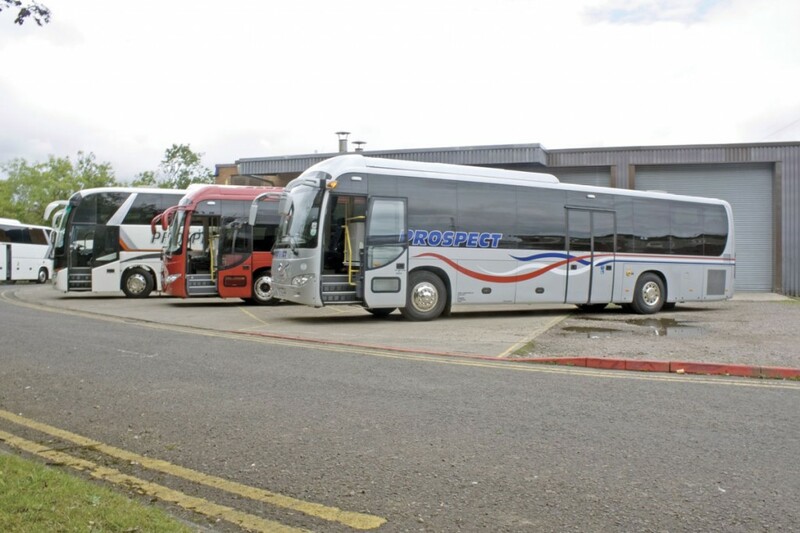 This has been their most successful year to date and Ray also intimated that there was currently an order for 18 coaches, destined for a London operator, but he wouldn’t disclose anything further. The current waiting time for a vehicle is four months and all of the coaches are built to European Whole Vehicle Type Approval and get certified in China, alleviating what was a previously long wait for homologation of the vehicle. The coaches available on the day were ready to be delivered to customers or were already being operated. In this instance, three of Prospect Coaches of Stourbridge’s four King Longs that they have in their fleet were available to view. 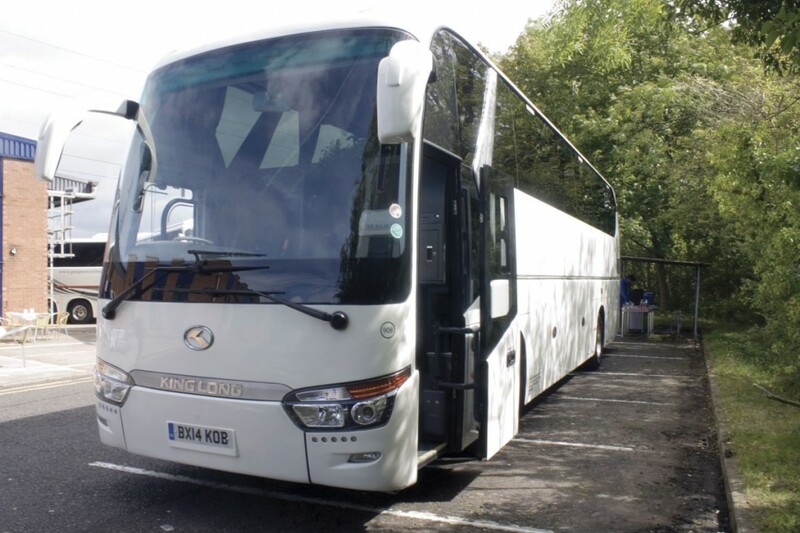 Now that King Long has a few years trading in the UK under its belt, it has helped with offering finance for the vehicles as the residual value of the coaches is, according to Ray, about on par with Mercedes-Benz. I spoke to a used coach specialist who said that their depreciation rate was on a par with other manufacturers’ and that there was a market for used King Long coaches. Lombard, Lloyds and Santander all offer finance, as do a number of second tier brokers and Ray is looking at the prospect of offering in-house finance in the future. King Long, like many manufacturers, doesn’t actively encourage part exchanges, the main reason being that they no longer have the room to house them. That said, their team of five salesmen will actively source a buyer for the part-ex vehicle if that is the operator’s preferred option. There are two new vehicles in production which weren’t available to view and there was no data available for them but I expect to see one if not both at Euro Bus Expo this year. I was told there are currently orders for two of each of them in place. The new vehicles are a 10m 39 seat midicoach and a 14m 61 seat tri-axle which will feature the new DAF MX-11 Euro6 engine. They are hoping to change from the confusing numbering system currently in place and they have registered a number of names following a Chinese theme. Something King Long has been keen to address is its after market and spares sector of the business and King Long Direct was set up four years ago to combat the problems that they were having. They have a dedicated parts and after sales team who all come from a bus and coach background and is headed up by the much respected and award winning engineer, David Hoy. The workshop houses six pits, some of which are accessible from the outside and the parts store conveniently leads off from here. Ray informed me they currently hold over £1m worth of parts in stock and the warehouse has, ‘enough stock to build at least two complete King Longs, minus the engine.’ From the large number of body parts and glass panels I could see, they certainly do seem to be prepared for most eventualities. They offer a two year bumper to bumper warranty with all new vehicles and this makes it even more essential that these parts are available should a customer need one. On the day I visited, the first pick rate for in stock items was 96.4%. They are now able to monitor part trends and have a direct link to their European counterpart’s stock so should they not have the item required, they can get it from France or Italy for the next day. Despite being a Chinese built vehicle, many of the parts, fixtures and fittings are recognised brands, including ZF gearboxes, Webasto heating, Fainsa seating, Cummins engines and Bradtech serverys, making maintenance and repairs easier for the engineers who will most likely have worked with these manufacturer’s products before. As part of the package, King Long offers a two day maintenance course to the operator’s engineers and once completed, they will receive a certificate of competence. There are currently 22 approved King Long service and repair centres across England, Scotland, Wales, Ireland and Northern Ireland. 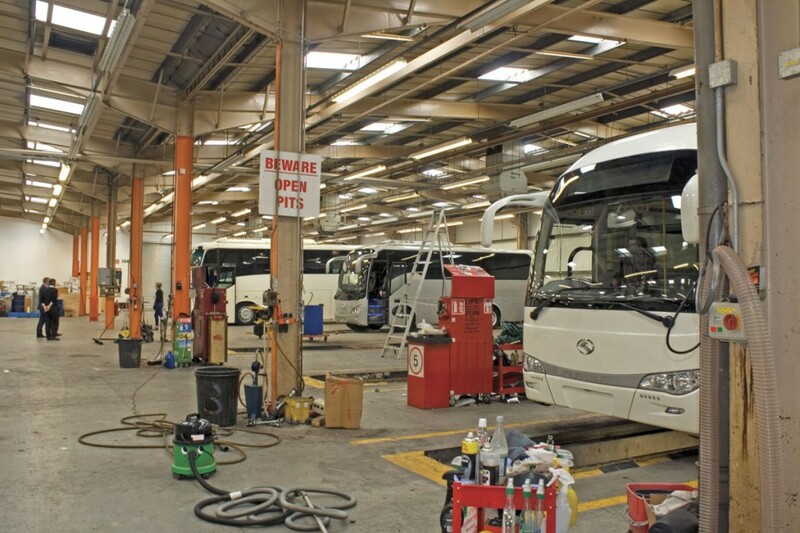 King Long currently sells maintenance contracts with their 12m City Buses to Airparks and they can see an opportunity to grow this side of the business. I was able to go out on a test drive on the XMQ6900 9m, 35 seat midicoach, with David from W Gordon & Sons of Rotherham. This is King Long’s top seller in the UK and I can see its appeal. It had a quality feel about it which many midis don’t have and it didn’t feel like a van conversion. The full size seats are produced under license to Fainsa and are fully adjustable recliners. These particular ones were leather upholstered although moquette is available if preferred, and for the comfort of the larger traveller, the gap between you and your neighbouring passenger can be extended. That said, you would need to be on rather friendly terms with them should you be in the aisle seat, wishing to charge your phone/laptop as this would require leaning across them as the sockets are set into the outside panel. There are plans for these to be fitted between the seats on newer models. I found the seat particularly comfortable, with enough leg room and thanks to the large windows, visibility was good. There is plenty of over-head storage as well as under vehicle luggage compartments on either side and with sufficiently wide aisles; I wouldn’t feel that I was inconveniencing fellow passengers or the driver by bringing on board several shopping bags on a long trip. This is designed well for long journeys as it is fitted with a washroom/WC and two flip down monitors which are linked to the audio/visual entertainment system. It has a lockable fridge, although rather inconveniently positioned in front of a double seat by the toilet and a microphone by the courier seat. The 6900 is fitted with a Cummins ISBe5, six cylinder, 6.7litre, 250bhp engine, which is said to achieve 13-15mpg. It comes with ZF six-speed automatic gearbox with a kick down on revs for when needed. Cruise control and hill hold come as standard and a speed limiter is also fitted. A cab fitted internal monitor feeds information from the camera situated by the offside centre door and also serves as the reversing monitor. The vehicle can be made fully DDA compliant, and one is already in use by a London operator. The centre aperture is widened and a cassette lift fitted. PLS lifts have been retrofitted in the past but they use an alternative supplier when factory produced. The opposite seats, which are on Unwin tracks, are removed to accommodate the wheelchair. The obvious disadvantage to this system is that loading then takes places from the road side causing potential safety issues. A diagnostics panel keeps the driver informed of any potential problems and an alarm on the AdBlue monitor will sound and independently reduce the speed of the vehicle should levels become too low. A covered switch to prevent accidental activation houses a fire extinguisher button. Powder is released at four points of the vehicle, covering the turbo and engine. CCTV and Mobile Onboard wi-fi can be fitted as extras. David described the 6900 as ‘a proper little coach’. He had seen them previously and this was the first opportunity he had to drive one. Visibility was good although there was a blind spot over his right shoulder due to a window post, but he did say that providing the passenger behind hadn’t got the curtain closed, this wouldn’t be a problem.